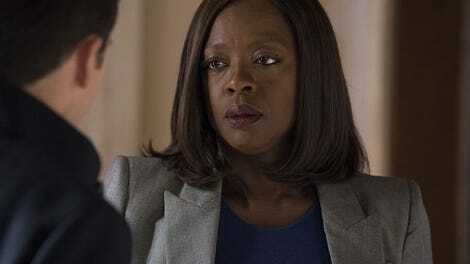 “I can’t be strong all the time,” Annalise Keating declares during another one of her terrible therapy sessions to her terrible therapist Isaac. Since the beginning, How To Get Away With Murder has challenged the concept of the “strong female character.” What, after all, does “strong female character” even mean? It’s too broad, too prescriptive of a term to really connote anything subversive. “Strong female character” is overused and under-defined to the point that it’s meaningless. Instead, we should talk about complex, well written female characters who don’t have to be strong all the time in order to be deemed worthwhile. In real life, Black women are constantly expected to be resilient, strong to the point where they’re invincible, and that places unfair expectations on Black women to merely withstand all that the world throws at them. It’s an insidious form of misogynoir. But How To Get Away With Murder is one of the few shows on network television that confronts misogynoir head-on. Annalise is much more than a “strong female character.” She’s complex and flawed, and even though there are inconsistencies when it comes to many of the other characters on the show, she has been well written and compelling since the beginning. Viola Davis especially imbues her with specificity and humanity. She’s a powerful character precisely because she isn’t strong all the time. But people expect her to be. 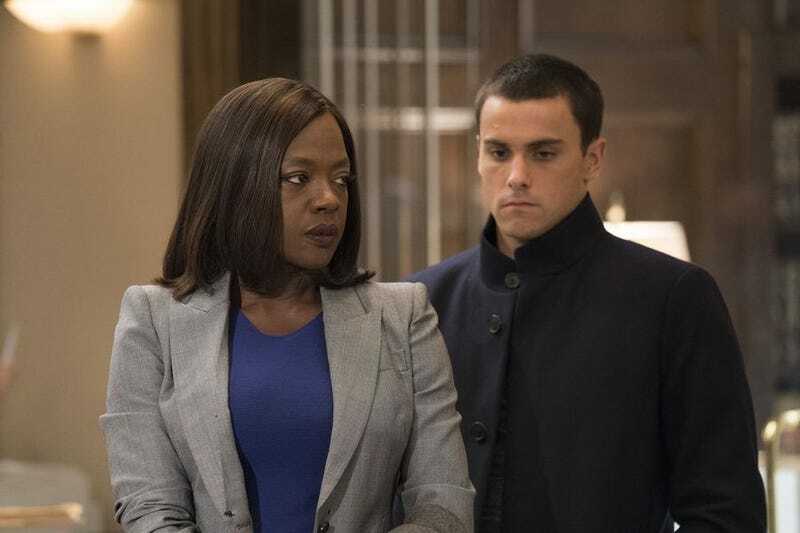 Because even when it gets caught up in all its over-the-top twists, How To Get Away With Murder remains grounded and real in its depiction of systemic injustice and the unfair expectations and assumptions placed on women—and especially women of color. “Stay Strong, Mama” touches on a lot of those issues. Denver takes Bonnie off the class action case, even though she’s the one who pursued it in the first place, because he deems her “too emotional” for the job. Ambitious, passionate women are often derided as being “too emotional.” Annalise’s class action lawsuit, which has been unfolding on the sidelines throughout the season, final gains some momentum and takes a more crucial role in the narrative. In an attempt to derail her efforts, Denver pressures Claudia, another one of Annalise’s former cell mates, to drop out of the class action by threatening to take away her family’s home. Annalise barges into the D.A. office and points out that they’re punishing the poor for the sake of politics and saving their own asses. She points at all the obvious hypocrisy in the department. It lights a fire underneath Connor, who is...suddenly her number one sidekick? As we saw last episode, Connor came to Annalise during a truly low point in his spiral. And presumably we’re supposed to just buy that he’s now fully on Team Annalise. Initially, I was intrigued by the notion of Connor, the last person of the Keating Four I ever expected to forgive Annalise, suddenly teaming up with her again, but “Stay Strong, Mama” does not make a compelling case for their reunion. It all happens very fast and with little regard for the past. Connor jumps onboard and then commits himself even more after the outburst at the D.A. office, supposedly moved by Annalise’s new mission to help all those wronged by the state. Oliver accepts it rather quickly, noting how happy Connor suddenly seems. Allegiances change all the time on How To Get Away With Murder, and this is one of those times when it just seems arbitrary and convenient. Laurel’s revenge plot also gains some much needed momentum insofar as her father’s motive for killing Wes finally becomes clear. His company is going public, and Wes going to Denver with everything he knew would have unleashed a slew of secrets that would have hurt Laurel’s—and therefore her father’s—reputation to the point of destroying the company. In other words, it all comes down to the money. It’s not a particularly shocking development. Part of the problem with using Laurel’s father as a Big Bad has been the fact that he seems so emotionally removed from the rest of the characters. As it turns out, his motive is emotionally removed, too. It’s a straightforward motive, but it doesn’t make for a particularly juicy twist or even a good story. He was just protecting his company...a nebulous company that hasn’t been a real part of the show until now. When Laurel and Oliver pressure Michaela to betray Tegan, she says she can’t. Michaela and Tegan’s mentor dynamic is already more convincing and meaningful than some of the other relationships that have been around for longer, like Michaela and Asher’s relationship, which only worked when it was mostly for the sake of comedic relief. Asher becomes increasingly suspicious of Michaela in this episode to the point where he actually gives Laurel a teddy bear with a camera in it so he can spy on them. He catches them plotting against Laurel’s dad, and he confronts Michaela about it, hurt that she didn’t fill him in on the fact that Laurel’s dad is a murderer and yelling about her about how people who love each other don’t lie. First of all, it seems pretty obvious that Michaela was lying in order to protect him, and he’s a fool not to see that. Second of, one could argue that people who love each other also don’t spy on each other! Asher’s hardly a victim here. And other than reminding me how much I hate these two as a couple, this storyline also reinforces the show’s ongoing theme of surveillance. Everyone is always watching each other, which maximizes the show’s sense of paranoia. Speaking of relationships that don’t really make sense, Frank’s sudden insistence that he wants to raise Laurel’s baby with her because he loves her is very haphazard. It doesn’t necessarily come out of left field, but it still feels out of place. Frank’s entire presence in this season has been uncertain and incidental (though he’s not quite as purposeless as Nate). Throwing all his eggs in the Laurel basket just seems like a last-ditch effort to keep him relevant instead of coming off as meaningful character development. But no character is more confusing this season than Isaac. As if I didn’t think he were already the worst therapist in the world, this episode shows him seeking therapy from his...ex-wife? What is evening happening here? He’s conflicted over whether to tell Annalise that Bonnie came to him—except, he isn’t conflicted at all. He’s just sort of acting conflicted and asking his ex-wife what he should do, and when she presents him with very straightforward and rational solutions, he rejects them entirely! Instead, he visits Bonnie at work to tell her that she should keep going to therapy because she was making good progress. And he keeps listening to Annalise talk about Bonnie and just pretends that he has no idea who she’s talking about. On top of all that, we also learn that some of Annalise’s own traumas are shared by Isaac in a way that he can’t quite reconcile: He also lost a child, a daughter. And something his ex-wife says also suggests that he has been suicidal in the past like Annalise, who talks about having attempted suicide after losing her baby. Isaac said in a previous episode that Annalise is a potential trigger for him, and that seems doubly true now. It’s unclear exactly what all of this is supposed to mean, what—if anything—How To Get Away With Murder is trying to say about mental health and therapy when it comes to Isaac and his flaws. The character doesn’t fit into the narrative at all. For a while, he just seemed like a sounding board, but as the writers develop him more and make it seem more like he’s a key player in the season, the less clear his role becomes. Every new development with the character just seems arbitrary and melodramatic in a way that doesn’t add to the story. Who even is Isaac Roa? How To Get Away With Murder is still struggling with the big picture details, and that doesn’t bode well for the impending midseason finale. There’s one more episode before the midseason finale. Seriously, what is the point of Nate this season? It looks like Asher/Bonnie might be a thing again. Asher suddenly wondering if Michaela is cheating on him with Laurel makes me feel like the show is trolling me personally, because I have shipped Laurel and Michaela since the beginning. I like that Annalise says that Connor’s father isn’t right for him. Usually when someone says someone isn’t right for you, they’re talking about a romantic interest or a friend, but hey, we don’t get to pick our family members, and for some people, blood relations are unhealthy. How To Get Away With Murder often blends the boundaries of traditional relationships.